The 458 Speciale A (A as in Aperta) new limited edition special series is a celebration of the dazzling success of the various versions of the 458, a model that has collected an array of international motoring media awards and track victories, not least a double WEC title and category wins in classic endurance races, such as the 24 Hours of Le Mans, the 24 Hours of Daytona and the 12 Hours of Sebring. Dedicated to just 499 Ferrari collectors, the 458 Speciale A is the most powerful spider in Prancing Horse history, effortlessly marrying extreme performance with the sublime pleasure of drop-top driving. Its aluminium retractable hard top, which takes a mere 14 seconds to deploy or retract, helps reduce the weight difference with the Speciale coupé to just 50 kg. 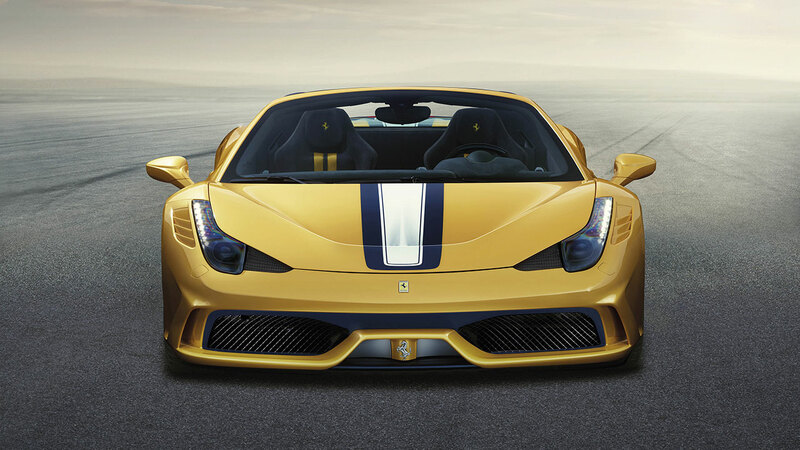 The 458 Speciale A sports the most powerful naturally-aspirated road-going V8 engine ever built by Ferrari. It punches out a massive 605 cv (135 cv/l specific power output) and 540 Nm of torque at 6000 rpm yet only generates 275 g/km of CO2 emissions. The three international Best Performance Engine awards the V8 has won are acknowledged on a special plaque in the cockpit. 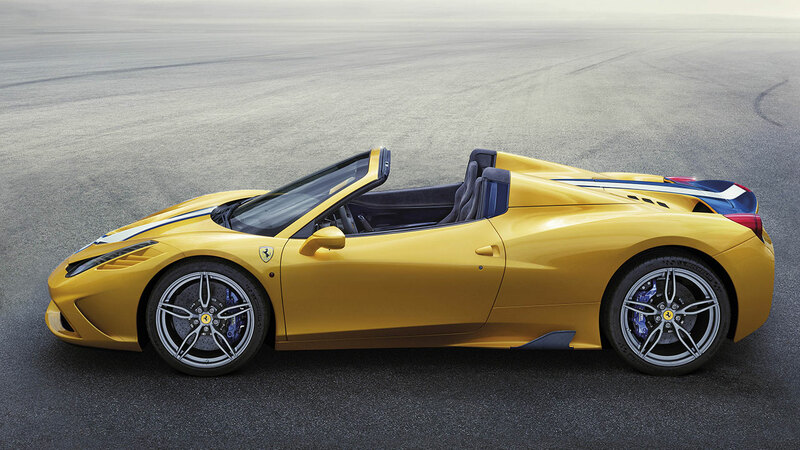 The new car sprints from 0-100 km/h in just 3.0 seconds and has a Fiorano lap time of 1’23”5. These superb results are thanks in great part to its front and rear active aerodynamics, the rigidity of a chassis that incorporates 10 aluminium alloys, and Side Slip Angle Control (SSC) which guarantees unparalleled sporty driving in all conditions, underscored by the seductively exhilarating signature Ferrari soundtrack. As is the case with all Prancing Horse cars, the 458 Speciale A’s sculpted forms are absolutely performance-oriented. In fact, a series of innovative and original bodywork solutions has made the 458 Speciale A the most aerodynamically efficient Ferrari spider ever. Punching out 605 cv at 9000 rpm, the 458 Speciale A’s engine is the most powerful naturally aspirated V8 ever built in Maranello and also sets a new specific power record (135 cv/l) for a road-going power unit of this type. These two figures alone speak volumes about the extraordinary prowess of this 4497 cc mid-rear engine. The work carried out on the car as a whole has also delivered an exceptional weight-to-power ratio of 2.21 kg/cv which results in such unparalleled performance levels as 0 to 100 km/h acceleration in 3” (0 to 200 km/h in 9”5) and a Fiorano best lap time of just 1’23”5. To achieve these results, the 458 Speciale A’s combustion, mechanical and volumetric efficiency were all significantly improved with a focus on reaching ambitious targets such as boosting torque at all revs through upping the compression ratio to 14:1, the highest for an engine of this kind. Clearly, the transfer of Ferrari’s Formula 1 expertise and technology was fundamental too. This is true not merely of the design phase but also the production and control processes involved: the engine is the product of the cutting-edge in-house foundry which also casts leading-edge components with extreme structural and dimensional characteristics, exactly as happens with the Scuderia’s single-seaters. Improved combustion chamber fluid-dynamics, new intake geometries and a new cam profile are just some of the modifications that helped the engineers meet their goals. Several components were also reviewed (new materials were adopted for the pistons and con rod bushings) and this too made a significant contribution. Lastly, the crankshaft and intakes systems were also redesigned, with the latter slashing 8 kg off the engine’s overall weight. The soundtrack, both inside and outside the car, is full-bodied and uncompromising too, thanks to the position of the tailpipes, the configuration of the silencers and the redesign of the inlet tract. 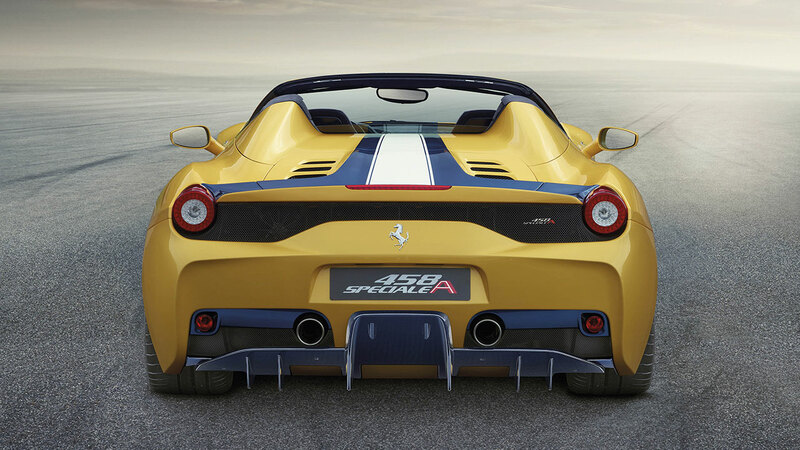 The 458 Speciale A’s is the most aerodynamically efficient spider in Ferrari history with a coefficient of 1.37, obtained as the result of a series of original and innovative solutions that delivered exceptionally high downforce (Cl 0.485) whilst keeping drag very low (Cd 0.355). The use of Ferrari-patented active aerodynamics is pivotal too and allows different configurations to be adopted to suit different requirements: maximum downforce when cornering, minimum drag on straights. There are two vertical flaps on the front of the car plus a horizontal one on the underbody. At relatively low speeds, all of these are closed, channelling air into the radiators to guarantee the necessary cooling for the engine. However, at over 170 km/h, the vertical flaps open, thereby reducing the volume of air reaching the radiators thus cutting drag. At speeds of over 220km/h, however, the horizontal flap lowers to balance downforce between the front and rear axles, leading to a 20 per cent shift in overall downforce towards the rear. Part of the increase in downforce as well as the 4 per cent shift in the aerodynamic balance over the front are achieved by means of turning vanes at either side of the front bumper which make the most of the lateral sections of the splitters. Aerodynamic fins contribute too. The front dam creates a separation zone in the air flow immediately after the leading edge of the front splitter while the hump does the same at the start of the flat underbody, reducing pressure on the front of the car. A rear spoiler with a larger surface area and more pronounced shape has also increased Cl on the rear by 7 points. Additionally, moving the tailpipes has allowed the diffuser to be redesigned to enhance the extraction capacity of the underbody thereby generating greater downforce across the latter’s entirety. Downforce is boosted still further by the mobile rear flaps which raise and lower as required (raised for more downforce, lowered to minimise drag): electronically controlled, they can be lowered to just 17°, which stalls the diffuser and reduces Cd by 3 points. 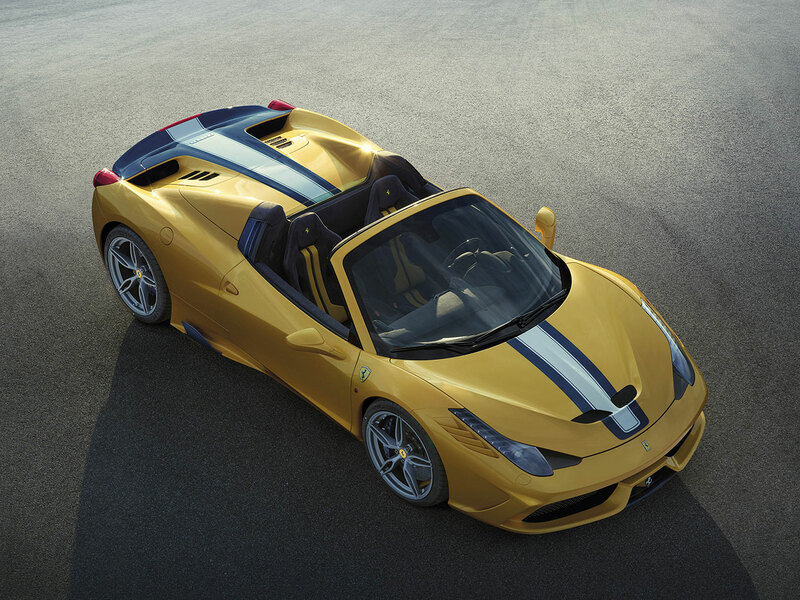 The 458 Speciale A adopts the innovative retractable hard top (RHT) that has become a signature of Ferrari spiders with this particular architecture. Extremely light, compact and functional, the RHT deploys and retracts in a record 14 seconds. Its mechanism is seamlessly smooth, giving the impression that its two sections simultaneously rotate. The RHT also significantly improves in-car comfort. When deployed, it offers better protection from the elements and improved sound insulation. Also, the high pressure field that forms over a car’s roof at high speeds will not cause the RHT to deform, and occupant space and comfort are augmented by its overhead double-curve shape too. The retracted roof only takes up 100 litres of space rather than the 150-200 litres required to stow a conventional hard top. The glass electric rear window can be adjusted regardless of whether the RHT is deployed or retracted. This ensures superb in-cabin comfort even at high speeds when the top is dropped. In fact, occupants can easily carry on a normal conversation at speeds of over 200 Km/h. When the top is retracting, the rear window automatically adjusts to its optimal position at around one third of its full height. This position was pinpointed through fluid-dynamic simulations and wind tunnel testing using 1:1 scale models, and guarantees absolute maximum comfort as it prevents vortex creation behind occupants’ backs and the nape of their necks. 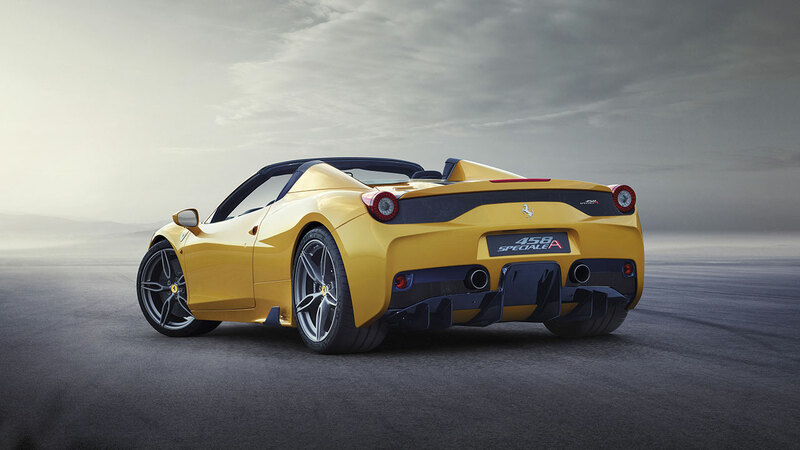 Record-breaking innovations were made to the 458 Speciale A’s electronics, brakes, suspensions and tyres also. Not only have they cut the car’s time over single laps, but also the repeatability of that performance on subsequent ones without demanding professional driving skills. The result is exceptional levels of pleasure behind the wheel. 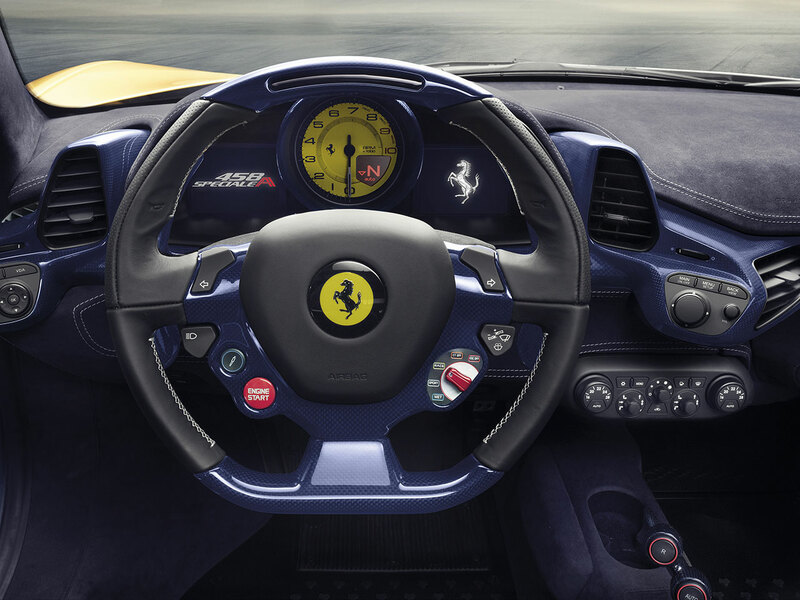 A blisteringly fast response time to inputs from the steering (0.060 seconds) and lateral acceleration of 1.33 g are also the highest figures of their kind ever achieved on a road-going Ferrari aimed at our most demanding performance-oriented clients too. In terms of electronic control systems, the big news is the world premiere of Side Slip Angle Control (SSC) and improved F1 transmission gear-shift control. Thanks to sophisticated algorithm, SSC carries out instantaneous analysis of the car’s side slip angle, comparing it with reference data, optimising engine torque and more efficiently distributing differential torque between the two driven wheels. With the Manettino set at RACE or CT OFF, the 458 Speciale A makes the most of available grip resulting in greater ease and more consistent control on the limit. 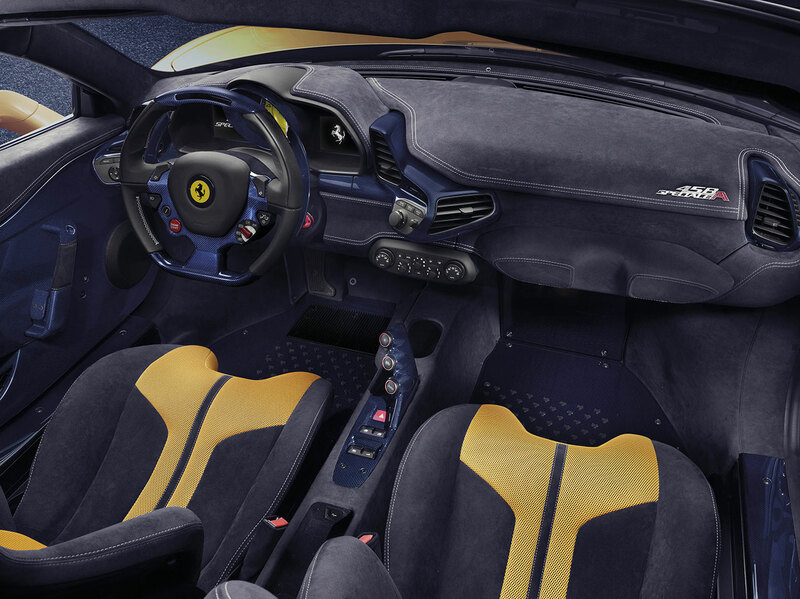 The dual-clutch transmission enhances the sporty feel of the 458 Speciale A still further also. A reduction in response times means 40 per cent faster longitudinal acceleration with engine revs adapting 20 per cent more rapidly as the car shifts up through the gears while, when downshifting, the transient time required for engine revs to match the gear ratio is 44 per cent faster. Every single component of the Brembo braking system has evolved and the solutions adopted for the LaFerrari have been adapted to suit it. Extreme Design calipers, HT2 discs with a high percentage of silicon and smaller front pads made from HY hybrid material are all new additions that add up to an 8 per cent reduction in stopping distances compared to the 458 Spider as well as more consistent performance under severe use. The 458 Speciale A is extremely efficient and satisfying in faster, sharper, more challenging changes of direction too, thanks to lightning-fast response to commands combined with reduced steering wheel activity. A major contributor is the Frequency-Shaped SCM-E (Frs SCM-E) dampers which have twin solenoids, a new CPU and new software that modifies the magnetic field every millisecond. The 458 Speciale A’s Michelin Pilot Sport Cup2 were designed specifically for the model. They guarantee a 6 per cent increase in grip and are made from a compound that boosts performance over a single lap in the dry, improves performance consistency over multiple laps and guarantees better grip in the wet. The forged 20” wheels are a new design and are over 12 kg lighter than the 458 Spider’s. The 458 Speciale A’s sculpted forms as is the case with all Prancing Horse cars are absolutely performance-oriented.Most of the bodywork panels have been redesigned without modifying either the passenger cell or the signature design features of the car. The composite bumpers have been redesigned and the front bonnet now features two deep air outlets to channel away the air exiting the radiator. The air outlets to the side of the headlight assemblies now also include three louvers reminiscent of the powerfully sporty Ferraris of the past, such as the 250 GTO and the F40. The rear features a Kamm tail with a full-width grille and twin exhausts. 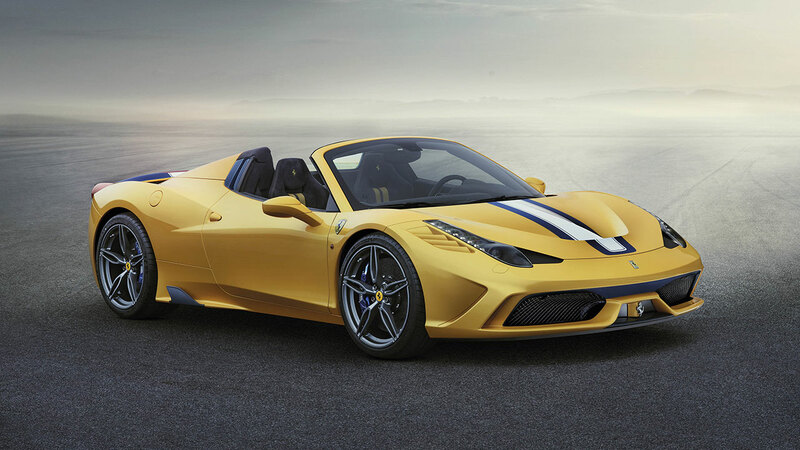 The 458 Speciale A is being premiered in an unusual yellow triple-layer livery with a Nart Blu and Avus white centre stripe. Its new forged five-spoke wheels are available in three colours: Oro, Grigio Corsa and diamond-finish matt black. The cabin has a distinctive racing-inspired atmosphere with the focus on eliminating all superfluous weight. This was achieved by adopting lightweight yet exclusive materials including Alcantara© and carbon-fibre crafted with Ferrari’s signature artisanal sophistication. This is particularly the case in the finish of the dash, the moulded door panels and central tunnel in carbon-fibre (also used for the treadplates). The cockpit plays on the overlapping of materials and forms in successive layers to visually break up the volumes and underscore the generous interior. The glove compartment on the dash has been replaced with convenient odds and ends pockets on the tunnel and doors, significantly streamlining the volumes in this area. Onboard ergonomics are now exceptionally functional, thanks to the use of the iconic bridge, a carbon-fibre wing that extends over the central tunnel section, angling the F1 gearbox controls towards the driver. The newly-designed seats have Sabelt carbon-fibre shells and boast excellent side bolstering thanks to an ergonomic design. The shoulder-rests are trimmed in Alcantara for improved grip while seated, and the backrests and seat itself are padded with a breathable 3D fabric to guarantee excellent air circulation and comfort.